Strong, intelligent, and generally affable, the Australian Shepherd has a lot to offer the right caretaker. Bred here in the United States as an all-purpose herding dog, the “Aussie” quickly found favor among the sheep and cattle ranchers alike for its versatility, loyalty, and insight. Aussies are medium-sized, well balanced dogs with keen senses, strong herding and guarding / protective instincts, and unusual agility. Although bred for the field, they don’t necessarily need a lot of room to run. However, it’s strongly recommended that those who invite an Aussie into their home plan on finding it plenty to do. Regular walks and play sessions are a must for this energetic breed. Homes with a securely fenced yard, or if living on acreage, a way to confine the dog when unsupervised, such as a kennel. People who aren’t willing to provide regular, vigorous exercise. Energetic, protective, watchful, highly intelligent, loving, happy. Needs a job to do, needs vigorous exercise, sheds a lot seasonally, can get destructive if not exercised enough, can get stubborn without adequate training, can be suspicious or shy if not socialized enough. Males are typically 20–23 inches at the shoulder, and roughly 50-65 pounds; Females are typically 18–21 inches inches at the shoulder, and 40-55 pounds. 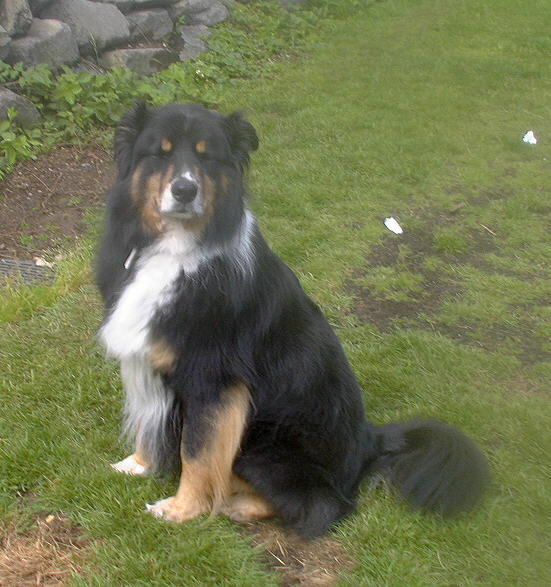 Australian Shepherds usually exhibit a main / dominant color, along with white accents. There is sometimes also a third contrasting color. Colors can include black, brown (“liver”), tan, red merle, or blue merle, as well as a combination of these colors. Because Australian Shepherds are herding dogs, they may consider children to be part of their “flock,” and try to chase and nip at them to herd them. Training is necessary to teach them that this behavior is not allowed. Although some Aussies will be dominant with other dogs and/or chase cats, most can get along with other pets and animals, though once again, they may try to chase and nip at them in order to herd them. Exceptionally intelligent, versatile, athletic, and excellent at competition (when trained); these dogs can learn almost anything. Australian Shepherds shed heavily and require regular brushing and combing to keep them detangled and mat-free. Known inherited diseases include hip problems, eye problems, and skin / allergy problems.